Dr. Jan purchased the practice in 1986. She is a native of Annapolis. Her veterinary education includes graduating from the University of Georgia Veterinary School in 1980 followed by two years of post-graduate work at the University of Guelph in both medicine and surgery. The practice started as a small one doctor, two room facility in 1987. Dr. Jan has directed the growth and provided the vision for the practice ever since. 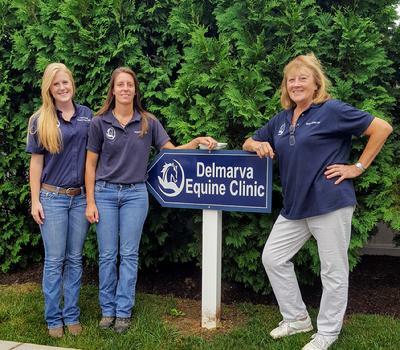 She has served as president of the DVMA, has served on the board of DAEC and is currently serving as the Delaware representative to the AVMA House of Delegates (since 1997). In 2009, she received the Kent County SPCA Animal Kindness Award and the 2009 H. Wesley Towers Veterinarian of the Year Award. Her husband, Scott Nichol, manages their farm with their horses, dogs and cats. Dr. Jan enjoys snow skiing, water sports, and competing her 3 show hunters on the A circuit beteen NY and FL. Dr. Egli has been with the practice since June 1999. She completed her undergrad at Rutgers University and her graduate degree at Cornell University College of Veterinary Medicine. She served as president of the DVMA in 2006. She has been involved in standardbred breeding since her undergraduate days, working at Stonegate Standardbred Farm. Dr. Egli currently has an off the track standardbred and an off the track thoroughbred, along with two house cats. In her free time she likes horseback riding and travel. Dr. Mitchell started with the practice June 2017. She completed her undergrad at Louisiana State University and her graduate degree from LSC School of Veterinary Medicine. While in school Dr. Mitchell concentrated on equine medicine and received her DVM with honors in May 2017. She enjoys hiking and camping with her dog Caper and watching LSU football gaames.